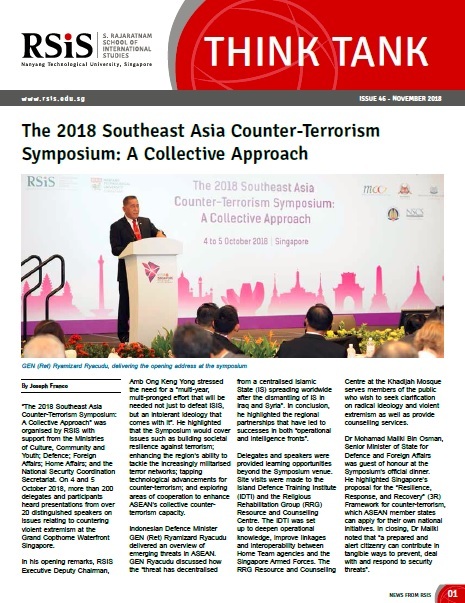 “The 2018 Southeast Asia Counter-Terrorism Symposium: A Collective Approach” was organised by RSIS with support from the Ministries of Culture, Community and Youth; Defence; Foreign Affairs; Home Affairs; and the National Security Coordination Secretariat on 4 and 5 October 2018. The RSIS’ Centre of Excellence for National Security (CENS) organised a workshop on “Understanding and Countering Disinformation, Online Falsehoods and Fake News” on 24 and 25 July 2018. Ms Federica Mogherini, the European Union (EU) High Representative for Foreign Affairs and Security Policy and Vice-President of the European Commission, presented an RSIS Distinguished Public Lecture titled “The European Union as a Global Actor”, on 3 August 2018. More than 420 religious and community leaders, interfaith practitioners, professionals, public officials, and students attended the fourth Distinguished Lecture & Symposium organised by the Studies in Inter-Religious Relations in Plural Societies (SRP) Programme on 22 September 2018. Prof Dr K.H. Kyai Ma’ruf Amin, Chairman of the Indonesian Ulama Council (MUI) and running mate of President Joko Widodo in the upcoming 2019 election, delivered an RSIS Distinguished Public Lecture on the Islamic principle of Wasatiyyah or moderation on 17 October 2018. Click here to read more stories in this issue.